What exactly are cat safe plants? They are plants proven to be non-toxic and generally non irritating in any way to our friends, the cats. Plants are wonderful to have in and around the house. But if you have a cat, you need to know if your favorite house plant could possibly hurt your feline companion, or if it's really OK for him. This article and the follow up, Cat Toxic Plants will help you learn the difference. Which Plants Are Toxic? Find Out Here! It's difficult to know while in your local garden center or florist which plants (other than cat-grass) you can take home without risking harm to your kitty. If only nurseries would include a category for cat safe plants, things would be so much simpler! A beautiful bouquet of lilies, for instance will kill your cat if he eats them. Any and all Lilies (even though some are not listed as toxic, I say take NO chances) MUST be kept away from cats. If however, you cat wants to munch on your African Violets, he will be just fine! There is no way to identify cat safe plants visually. I will freely admit that I have not done all the research regarding the cat safe plants listed here. I have compiled this list by consulting various experts on the subject including the ASPCA website, local veterinarians, botanical societies and more. While cat safe plants are often safe for other pets, please research toxicity regarding other animals as the scope of my research has been limited to felines. Spring 2010 Update! - Great news; Lilacs are NOT toxic to cats! Of course, you should not let them chew on them alot since it may irritate their mouth, but due to their bitter taste, that is unlikely to happen. So now that you know you can go ahead and bring some of that gorgeous scent and beautiful color indoors! And just in time for Mothers day and summer, more good news from the ASPCA; There is currently no data indicating that roses (Rosa spp.) are poisonous to cats or other pets. Cat Lady note: However, it is important to keep in mind that even plants considered to be non-toxic can produce minor stomach upset if ingested. In addition roses have thorns, which could cause injury to curious noses, mouths and paws. Because of this, it is still a good idea to discourage your cat from nibbling on them. Of course, you can visit all the sites and collect the information on your own, but I felt the need to make sure that my readers would be able to refer to this list of cat safe plants quickly and easily from my cat site. 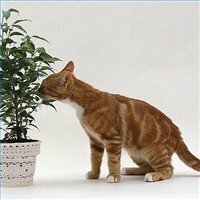 On this page, I have listed Cat Safe Plants. To find out which plants are poisonous to cats and what to do in the case of a poisoning incident, please visit my page on cat toxic plants. Please note that while all the information on my pages and lists is as accurate as I can provide, I cannot legally make any claims or warranties as to the completeness or accuracy of the information. When in doubt, especially with regard to cat toxic plants, always consult with your veterinarian.